Memoirs of Zvi Aviram who survives the Nazi time in the underground resistance movement of Berlin. He tells how in summer 1945 he accompanies a group of 22 Jews infected by tuberculosis from the Soviet zone to the Ottilien Hospital. Here Dr. Grinberg helps him to get into contact with the Jewish Committee of Munich (p. 179-181). For the next two years, he helps Displaced Persons to emigrate to Israel and follows them in 1948. Josef Beischer lived in St. Ottilien as son of the local innkeeper at the time of the liberation and tells about his memories of this time. See the InterviewBeischer. Memoirs of a Jewish girl from Hungary who becomes a seamstress when the growing persecutions force her out of school. After her deportation to Ravensbrück, she finally is brought by train to Dachau for extermination. In Schwabhausen, she manages to escape and arrives in the hospital at St. Ottilien where she recovers. Her description provides insights into the everyday life of the hospital including the language problems between the patients: The everyday language was Jiddish which was not mastered by the Jews from Hungary. Ben grows up in the Lodz Ghetto and at the end of the war is deported to the Kaufering camps. He survives the train attack in Schwabhausen and after his flight is found and saved by Dr. Grinberg. In St. Ottilien, the Jewish patients discover that among the German soldiers who are treated in the German military hospital are people from the SS. The guarding American soldiers have now not only to guard the German SS men, but to protect them from revenge. He describes the Liberation Concert performed by surviving musicians: „We felt special pride in our hearts. These men, symbolically wearing the concentration camp uniforms represented a new era, a new people, a renewed life.“ (page 258) After his reconvalescence, he is brought to the Munich DP Camp Feldafing. Rabbi Eli Fishman began writing about his experiences in the Shoah over sixty years ago, soon after his liberation. Surviving Auschwitz and the death march and liberated in Dachau he recuperated as a young man in St Ottilien and joined a group of yeshiva students there to continue studying under the guidance of the Chief Rabbi Shmuel Snieg of the American zone in Germany (p. 189-196). Together they prepared the „Survivors‘ Talmud“ for printing which was done in Heidelberg. He was ordained by Rabbi Snieg and served as his assistant until he emigrated to the United States in 1950. His work included the rebuilding of Jewish life in Germany, the republishing of a Talmud, and with the assistance of General Lucius Clay, aiding the „bricha“, the movement of Jews attempting to get to Palestine despite the British blockade. His book has been researched meticulously and contains much unpublished information. Collection of documents and oral history about the air raids and „Jewish tombs“ at Schwabhausen. Hebrew version in the „Yearbook of the Jewish National Fund“, 5708, 1948, English version translated by Israel Eins. According to the foreword, these memories were written 1946 in Jerusalem. Grinberg describes how the inhabitants of the Kovno Ghetto arrived at Dachau on July 16, 1944 to serve as slave labor in the 11 Kaufering camps. Several chapters deal with the everyday life in the concentration camp. Although nearly starving and daily threatened by imminent death, Grinberg and several other camp inmates start to plan for the future of the Jewish nation after the liberation. After some time, Grinberg is allowed to install a health station for the workers at the Kaufering construction site. After the German guards also start to come for treatment to Grinberg, he receives a number of privileges. When the Allied Forces come closer, the inmates of the Kaufering camp are put into cattle cars and transported into the direction of Dachau. When aircrafts start bombing the train, a part of the prisoners leaves it and in spite of the threats and random killings by the SS refuses to board it again. After many negotiations with the village authorities of Schwabhausen, some of the most severely wounded former prisoners are taken to the Ottilien Hospital. After heated arguments with the hospital director, Dr. Grinberg is finally himself put in charge of the hospital by the American Captain Raymond. Grinberg finishes his memories with the account of how the first Jewish casualties are buried at the Ottilien cemetery in the enforced presence of several German soldiers and the medical staff. When the American troops liberate the Kaufering concentration camps, they discover seven Jewish mothers with their babies who have miraculously survived. They spend a rehabilitation time in the hospital of St. Ottilien (pages 165-166). 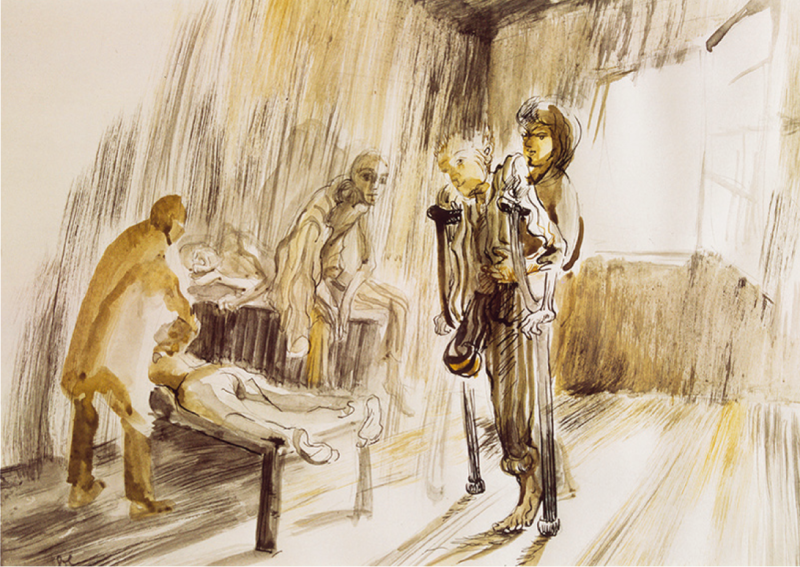 Memories of nurse Erika Grube, originally an artist, who started in 1944 as rehabilitation therapist in the military hospital of St. Ottilien. She describes how after the air raid at Schwabhausen about 50 wounded Jewish patients are brought to the hospital. After the arrival of American troops, the hospital is cleared from German soldiers and transformed into an all-Jewish hospital. The German personal (nurses and doctors) are in part split about the request to help Jewish patients. In detail, she describes her work and experiences with the deeply traumatized patients. Due to her artistic talent, she produces posters and drawings for the Zionist movement within in the hospital. Memories of a German nurse at the D.P. Hospital of St Ottilien: „The nurses were put into the empty cells of the monks. We were all people who had lost their homes and who were glad to have a roof and to receive every day food. The Americans cared well for the patients who at the beginning couldn’t digest the excellent food and who became even more ill. It took some time until we had reestablished them. We even received something of the special food for the patients. Some of them were very grateful about our nursing and gave us even precious chocolate or even a banana… After some time, all of us, patients, doctors and nurses, were transferred to Bad Wörishofen because the monks should receive again their monastery. In Bad Wörishofen we were lodged in the best hotels, Park-Hotel and Sonnenhof. Some of the patients needed 2-3 years until they had completely recovered. We had quickly become a community of solidarity. It meant receiving and giving. The patients showed us their gratitude in every possible form. For example, a lawyer helped me to get my widow’s rent again. We all were happy about the freedom which we had found again. Life went on. Couples found each other, children were born. I had even the permission to attend a Jewish baptism ritual which was a special expression of trust because this is normally not allowed for non-Jewish people.“ (p. 141-142). After attending a liberation concert given by emaciated concentration camp survivors at St. Ottilien, two Jewish-American soldiers wrote a letter about the criminal neglect and anti-Semitism of the American policy in occupied Europe. This letter turned into a crusade which saved untold numbers of lives when President Truman finally reversed US policy. An extraordinary autobiographical account by one of the letter-writers, „Surviving the Americans“ is the first book to present the genocide by neglect suffered by Jews and other camp survivors at the hands of the Americans after the liberation, and the first as well to tell of the campaign that eventually saved many of them. Letters of Matas Janušauskas, a Lithuanian factory director, about his involvement mit the Ghetto in Kovno and his relations to Dr. Zalman Grinberg. In the factory of Janušauskas, Jews worked as forced labor, among them Dr. Grinberg. Janušauskas arranged with Dr. Grinberg to take over Grinberg’s son Emmanuel who was smuggled out of the Ghetto. In July 1944 Janušauskas fled out of Lithuania, finally arrived in Southern Germany and returned the child to Dr. Grinberg. Grinberg employed him in the administration of the hospital until 1948 when Janušauskas emigrated to Australia. The letters contain some interesting information about the administration of the hospital, p. 143-160. Documents and photographs online on the website of the Genocide and Resistance Research Centre of Lithuania (Search term: Grinberg). Jewish Review/Jüdische Rundschau 1 (N° 4/5 – May/June 1946), p. 38-39: Pictorial Presentation of the DP Hospital St. Ottilien (JewishReview1946). Dr. Kaiser describes how he worked in the huge military hospital of St. Ottilien where about 2000 wounded German soldiers were treated. After the arrival of American troops all politically suspect medical personnel was brought away. He stayed with the remaining doctors and nurses for the treatment of the arriving Jewish camp prisoners from Dachau which were in an extreme condition. About 70 patients died already in the beginning, mostly from spotted fever and Tuberculosis. Another medical problem was the unused good food, especially butter provisions which the patients received as gifts from the army and which caused heavy diarrhea. His department was headed by Dr. Zalman Berman and Dr. Abraham Goldmann. Newspaper article about the St. Ottilien Hospital and its work: „Every birth is a joy for everybody in St. Ottilien… The Jewish progeny is growing. The people of Israel will live. More than 350 babies (this shows how they are multiplying) have already been born in St. Ottilien. Many people have found a home in St. Ottilien“. Rabbi Klausner, Jewish Army chaplain at the Dachau camp, describes how he met Dr. Zalman Grinberg and how they set up the hospital at St. Ottilien. Peter Kubierschky was 15 years old when WW II ended. His father was employed as doctor in the German military hospital of St. Ottilien and afterwards worked for the UNRRA hospital. Ben Lesser survived the Holocaust as a „walking skeleton“ of 16 years. From the Dachau concentration camp he was brought to the St. Ottilien hospital. He describes the daily life at the monastery DP camp, a first feast of Purim in July to make up for all the missed ones. In the camp he encounters a group of juvenile Chalutzim, pioneers, who want to settle in Palestine and joins them. Shortly afterwards, he surprisingly meets his sister Lola at the St. Ottilien Hospital who is just about to deliver the first baby of the camp. He decides to stay with her and together they emigrate to the U.S. in September 1947. His final statement: “Our time together in St. Ottilien was very therapeutic – medically and emotionally. For the first time in years, instead of being tortured and murdered, we were being taken care of. There were so many of us in the same situation, that it seemed as if we’d become one big happy family… And in experiencing the goodness of human beings, for the first time in many years, I felt a little hope that life might be worth living. And that there might even be a God.” (p. 147–167). In these memories Rabbi Judah Nadich describes his visit to the hospital St. Ottilien in August 1945, his encounter with Dr. Grinberg and the work in the hospital. Olejski, head of the Culture Department at the Landsberg DP camp, describes the life in the Kovno Ghetto and the situation in the Kaufering Lager. As eye witness he recounts the attack on the prisoner train at Schwabhausen. The announced continuation of the article is missing in the following numbers. See Landsberger Lager-Cajtung 16-1946. Mendel is just 7 years old when World War II erupts in Europe. He witnesses the complete destruction of his family’s life and home. Incredible luck, intelligence, bravery, humor and the kindness of strangers steer him and his family on a narrow path to surviving the holocaust. After the war, Mendel’s trials continue. He relates hard work, truck rides which lead him with a group of about 70 children to St. Ottilien, a missed boat to Israel, and the final passage to Canada where he could restore his life to the bounty he knew and lost as a young boy. Life story of Dr. Eli G. Rochelson (1907-1984) collected from documents, interviews and memories by his children. It includes a well documented part about Jewish life in pre-War Lithuania where Eli Rochelson grew up and a compelling description of the Nazi persecutions and the Kovno Ghetto. After the deportation to Dachau, Rochelson works at the Kaufering construction site (p. 132-139). At the end of the war, he witnesses the train assault in Schwabhausen (p. 141-143). After the liberation Dr. Rochelson set up and headed the hospital at the DP camp Landsberg which had relations to the close-by Ottilien Hospital (p. 143-158). In March 1946, he emigrated to New York. Yiddish Recollections of the time as patient in the DP hospital. 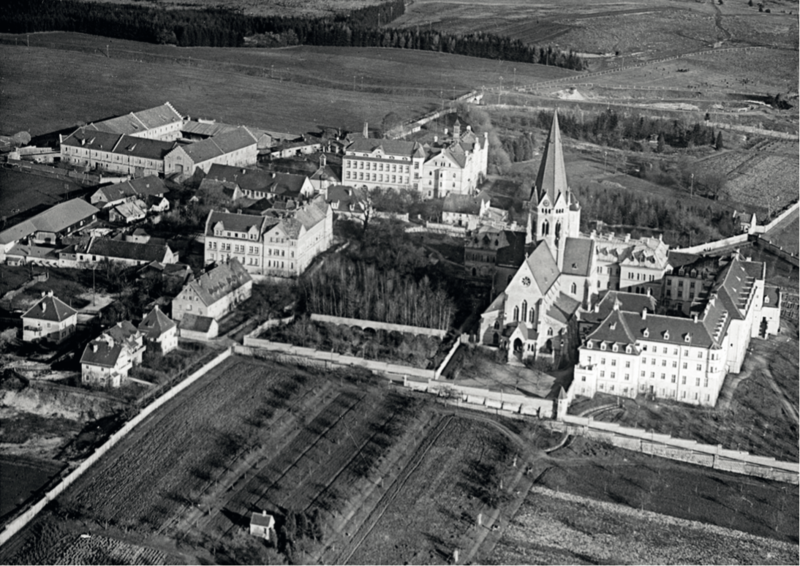 Lorenz Wachinger lived as boy in the boarding school of the monastery already opened again in November 1945 and tells about his experiences in the years 1947/48. See the Memories Wachinger. The short documentary film by Zvi Kadushin shows in an opening sequence the arrival of a military jeep at the hospital, the work of the medical staff (Dr. Zalman Berman and Dr. Chaim Ipp), a tour through the hospital and the delivery ward, rehabilitation exercises and the everyday life of the patients. It concludes with the circumcision rite of a new born child. The production was probably after the emigration of Dr. Grinberg in July 1946 because the film doesn’t show him. The documentary film produced and commented by Rabbi Abraham Klausner starts with scenes from different DP camps and shows the first Conference of the Committee of Liberated Jews in Bavaria. The focal point is a rousing speech of Dr. Zalman Grinberg followed by a speech of David Ben-Gurion. A film presenting the Holocaust from a Jewish point of view. The film was shot on location at the Landsberg camp and made by and about Jewish displaced persons. The film follows a Polish Jew (played by Israel Becker) and his family from the thriving Jewish community of Warsaw through the horrors of Auschwitz to the instability of refugee life in a DP camp. It culminates in the hope of rebirth in Israel. Documentary Film about Dawid Furman, a Holocaust survivor, and his meeting with the first delegation of the Jewish Brigade in June 1945 in St. Ottilien, 1994, 16 minutes. See the Youtube-version, kindly provided by Nachum Pur. Based on the true experiences of U.S. Army privates Edward Herman and Robert Hilliard, who were stationed in Germany at the close of World War II. They discovered the horrendous treatment of displaced persons in St. Ottilien, a displaced persons camp run by the U.S. military. In an effort to alleviate the suffering, the two GIs stole food from their own mess and smuggled it into to the camp. Then the two soldiers started a letter writing campaign, which caught the attention of President Harry Truman, who ordered an investigation that led to the end of the abuse. The film tells the story of the Jewish orchestra at the St. Ottilien Displaced Persons camp in Bavaria. From 1945 to 1948, the orchestra played in striped concentration camp uniforms, in front of a banner that read “Am Yisroel Chai” (“The People of Israel Live”). After garnering praise for their inspirational performances all over war ­torn Europe, the orchestra was asked to perform for the International Tribunal during the Nazi trials in Nuremberg and for the first Zionist congress. David Ben­Gurion and Golda Meir were among the orchestra’s fans, and on two occasions the ensemble was joined in Germany by conductor Leonard Bernstein. A talk of Yetta Marchuck Selengut about her return to her birth place at St. Ottilien and to Germany after 65 years on the Lowell Gallin Show. Memorial Concert held in honor of the Ottilien Liberation Concert of May 1945. Robert Hilliard tells about the Liberation Concert and his involvement in changing the situation of Jewish DPs. Research on the persons of Rabbi Klausner and Dr. Grinberg (p. 39-40). German study on the situation of Jews in postwar Germany. Overview in German language which in the first part treats the situation of Holocaust survivors in DP camps. Journalist and film director Bernard Dichek follows the traces of his parents who prepared their emigration to Israel in post-war Germany. In his article he documents his visits to the remnants of former DP camps in Bad Reichenhall, Bad Aibling and St. Ottilien. This doctoral thesis documents the history of Displaced Persons in the district of Landsberg am Lech. Some pages are dedicated to the St. Ottilien Hospital which was later integrated into the DP-Camp administration of Landsberg (p. 103-108). Study on the situation of about 250.000 Jewish survivors as „Displaced Persons“ in post-war Germany, their complex relation to their defeated oppressors and to the Allied occupation forces. Unpublished thesis for the History Faculty of the University of Munich about the Ottilien DP hospital. Research on the Talmud edition prepared by the Rabbis Snieg and Rose. Research on the person of Dr. Grinberg and the beginning of political organization of Jews in Bavaria (pages 47-48, 80). Unpublished paper of a student of the high school at St. Ottilien including interviews with survivors and rare documents. Unpublished Bachelor thesis with many helpful insights into the history of the delivery station at the hospital. Documentation of the KZ cemetery of Schwabhausen (p. 87-89) and of St. Ottilien (p. 83-86). Documentation of the history and tombs of the Jewish cemetery at St. Ottilien. Digital version: Jewish Cemetery. The article describes the role of Dr. Zalman Grinberg within the repatriation project of DPs to Israel. The thesis explains the origin and destination of the numerous children who lived in the DP camp including the children Kibbuz „Atid“. See: CarolinPiorun_DisplacedChildren. Short outline of the history of the DP hospital from the perspective of the returning monks (p. 97-102), impressive documentation of the everyday life in the hospital by the German nurse Erika Grube (p. 103-111). Wetzel, Juliane: Jüdisches Leben in München 1945-1951. Durchgangsstation oder Wiederaufbau?, in: Miscellanea Bavarica Monacensia. Dissertationen zur Bayerischen Landes- und Münchner Stadtgeschichte, vol. 135, München 1987. Doctoral thesis in German language on the organization and culture life of Jewish survivors in Munich and surroundings. The Ottilien hospital is treated on pages 232-233. Archives of the American Jewish Joint Distribution Committee with documents and photographs about the St. Ottilien DP Hospital. Records of the UNNRA (United Nations Relief and Rehabilitation Administration) about the DP Hospital St. Ottilien. Documents of the IRO (International Refugee Organization) about the St. Ottilien DP Hospital: Reports beginning from 1947 through to 1948 about the situation of the monastery and documentation of its close-down and transfer to Hotel Sonnenhof in Bad Woerishofen (AJ/43/814). Lists of patients, personnel and births in the DP Hospital St. Ottilien from 1945 up to spring 1948. The single patient’s files have to be searched under the name of the patient (data received from UNRRA, the International Red Cross and the World Jewish Congress New York). Documentation of Leo W. Schwarz, Director of JDC from 1946-1947. Fi01 (personal collection of DP documents by Wolfgang Jacobmeyer): vol. 80: Report of UNRRA officer Eli Rock to the Anglo-American Commission for Palestine which contains notes about the hospital St. Ottilien as one of the „brightest“ chapter of Jews in Bavaria. Vol. 108: Extensive interview with Rabbi Abraham Klausner who describes how he met Dr. Grinberg and how they managed to transform the military hospital into an all-Jewish facility. A 11.13.4. Letters of the monastery administration, documentation of the KZ cemetery, documents. A 196 (documents related to Dr Grinberg), A 3047 (documents about the burials at the DP hospital and the cemetery), A 10.203 (death cases in the D.P. hospital St. Ottilien until May 25, 1946), A 43.222 (list of buried persons at the Jewish cemetery St. Ottilien-Eresing from November 5, 1948), R 216 (Interview with Elias Kleiner), DVD 195 (Interview with Hanns Kaiser, German doctor at the DP Hospital in 1945-46). Memories in Hebrew and photographs. Zvi Kadushin Collection: Photographs from the DP Hospital from 1946 by the Lithuanian photographer Zvi Kadushin.